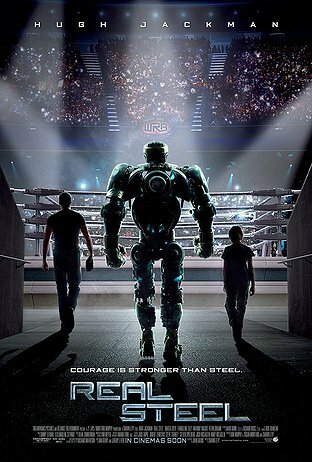 Real Steel is the real deal! The plot was predictable at times with estranged dad and son got together and bonded. The only reason the father, a struggling retired boxer, willingly allowed the son to stay with him was because he was getting paid. The father/son bonding scenes were different from my expectation and they do took a while to warm up to me but eventually they were heart warming/emotional at the end. However, the movie was a bit too long to my taste. Watch out for the next super star, Dakota Goyo! This kid is an excellent actor. He definitely added “flair” to the movie with his dancing moves. Hugh Jackman looked like he know what he was doing watching his boxing moves. After doing some research, it looked like he did get some training with Sugar Ray. Charlie’s best friend, Bailey, played by Evangeline Lilly only has limited on-screen time. The last two boxing matches of Atom versus Twin Cities and Atom versus Zeus will keep the viewers talking even after the movie. Just like real-life, we can’t plan for all contingencies and it was true for Zeus creator. Zeus wasn’t build to withstand the entire duration of the boxing match with Atom. I left the theatre smiling and vowed that I would get the DVD so that I can watch it again.